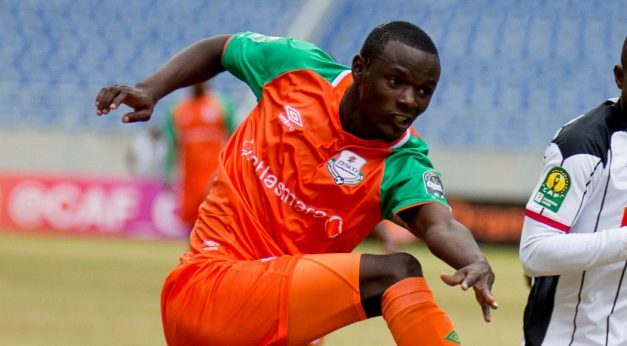 Lazarus Kambole scored a sensational hat-trick in a space of five minutes as Zesco United revived their hopes of reaching the quarterfinals of the 2018 CAF Champions League with a 3-0 away win over Mbabane Swallows in Maznini on Saturday. Winless Zesco were under pressure going into the penultimate match of this season’s group stage, needing no less than three points to have any realistic shot at making it to the quarterfinals. The Ndola giants were bottom of the table on two points, having registered two defeats and two draws. After a quiet opening quarter hour, Swallows created the first clear chance as Niger midfielder Quadri Aladeokun found himself in space on the edge of the box and let fly with a low shot which was well saved by Jacob Banda. The Swazi side had another good opportunity just past the half-hour mark, as Njabulo Ndlovu was left unmarked at a corner kick, but he put his header wide of the far post. Zesco had held their own in the match, but in a five-minute period near the end of the first half they effectively ended the game as a contest with a rapid-fire hat-trick from Kambole. The attacker first finished off a sweeping passing movement in the 38th minute – his initial shot was saved by Sandanezwe Mathebula, but he followed up on the rebound and tucked the ball into the bottom corner. In the 40th minute Kambole picked up on a loose ball on the edge of the box, after great high-pressing from Zesco, and tucked the ball beyond the ‘keeper to make it 2-0. The 24-year-old Zambian international completed the hat-trick with the best of his goals in the 43rd minute. He turned the defence from a long ball, spotted Mathebula way off his line and coolly finished from long range. To their credit, Swallows pushed hard to try and find a way back into the game in the second half, but when their best player Tony Tsabedze missed a great chance in the 75th minute, it was clear that the hosts would end on the losing side. The result sees the Zambians move to third place on the Group D log on five points, level with second-placed Primeiro de Agosto on Angola. The Swazi team drops to the bottom of the log on four points. The teams will wrap up their group phase campaigns with matches on August 28. Zesco will be at home to Etoile, while Swallows travel to Luanda to face Agosto.